With Guillaume at the guitar and Gaby at the drums and harmonica, you can actually make a good band. 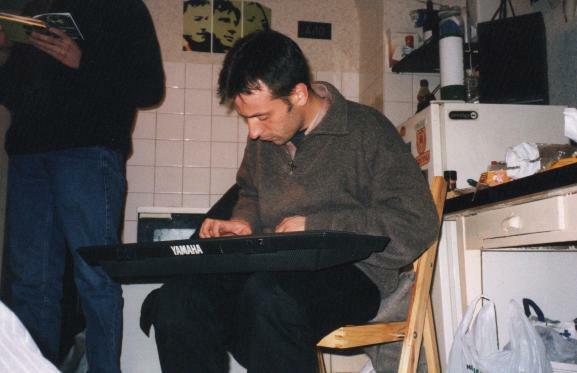 Hey, in this picture, Gaby is in Guillaume’s place, playing with a small synthesizer that was belonging to Marc and that I now have, who knows why, in my apartment! Gaby was studying social sciences at the same university where Pascal was studying English. They also both live in the center of the city, and have often been hanging around together. Gaby is very nice, calm, but passionate. Every time Babak comes back to France for vacations, he wants to meet Gaby and talk about old bluesmen and jazzmen with him. We always learn something with Gaby.